It was on April 14th, 1912 — almost 100 years ago — when the last meal was served in the first-class dining room on the RMS Titanic. 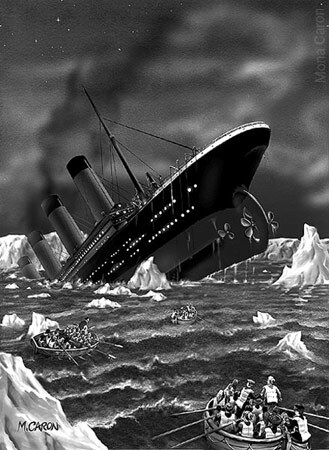 As we all know, later that night, the ship collided with an iceberg and sank, with the loss of over 1500 lives. 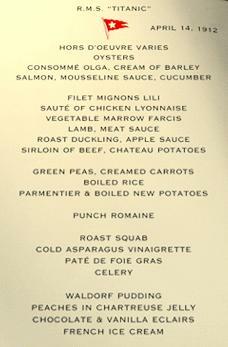 Here’s a detailed look at what was on the menu for the first-class passengers. Escoffier has nothing to say about Waldorf Pudding, but research on the net turns up several improvised recipes (1, 2, 3), none of which are authentic. They involve essential ingredients based on the famous Waldorf Salad, which has apples, walnuts and raisins, but I can’t help but suspect that these guesses may be off course. While it’s true that the one of the more common recipes that the Waldorf Astoria is known for is the salad, there’s no reason to conclude that these are the only ingredients that could possibly be in a dessert named after it. Update, 4/28/08 : I found some old cookbooks online that list recipes for Waldorf Pudding. One has apples, the other one doesn’t. Read all about it. Each of the 10 courses was served with a special accompanying wine. Following the tenth course, fresh fruits and cheeses were available followed by coffee and cigars accompanied by port and, if desired, distilled spirits. You may also be interested in reading about what some of the other passengers on the Titanic were eating that night. Also, more information on the elusive recipe for Waldorf Pudding. I found this to be a surprisingly readable book. The author, Steven Rinella, is a writer for sports magazines, and he and his friends spend much of their free time hunting and fishing. When he got a copy of The Escoffier Cookbook, it started him on a year-long quest to create a fabulous feast for his friends using wild game and products he scrounges up over the course of a year. With detailed information about his successes and failures (including the dreaded food poisoning), as well as the prosaic and interesting adventures he has to get the goods for his feast, I had a hard time putting the book down. He goes above and beyond what most of us would ever imagine doing for a holiday feast. While the author does relish in his intimate knowledge of exactly where his food comes from, this book is definitely not for the squeamish. And, make no mistake, there’s not a single recipe in this book. An excerpt from the book’s second chapter can be read on Culinate.com. 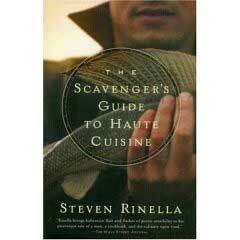 The Scavenger’s Guide to Haute Cuisine, by Steve Rinella. When making chicken stock, using raw chicken will give you “white” chicken stock, while using a roasted bird will give you “brown” chicken stock. According to Escoffier, white stock is used for the base of white sauces. Brown stock should be the color of “fine burnt amber” and used for the base of soups and thickened gravies, and for meat glazes after it’s been reduced. He also suggests using it to moisten meat for braising. In both cases, he suggests breaking the bones, and that if you want the stock to be gelatinous, you need to simmer the stock for at least 8 hours. His recipes (below the break) aren’t limited to just chicken meat, either, and they’re naturally more involved than almost any other recipe for chicken stock that I’ve ever come across.